The King without a Crown. 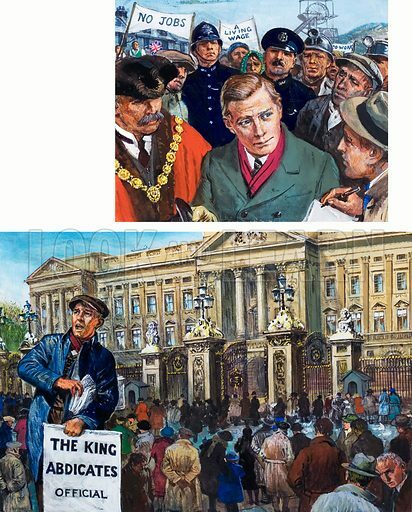 In 1936 the new king visited the depressed areas of South Wales (top). News of the Abdication spread quickly, and soon there were anxious crowds outside Buckingham Palace (bottom). Original artwork for the illustrations on p 29 of L&L issue no. 1024 (24 October 1981). Available worldwide for immediate download up to 3,586 x 4,461 pixels.